Let your little engineer have fun playing with blocks and give shape to their creativity with the Lenoxx 2-in-1 Building Block Activity Play Table & Chairs set. 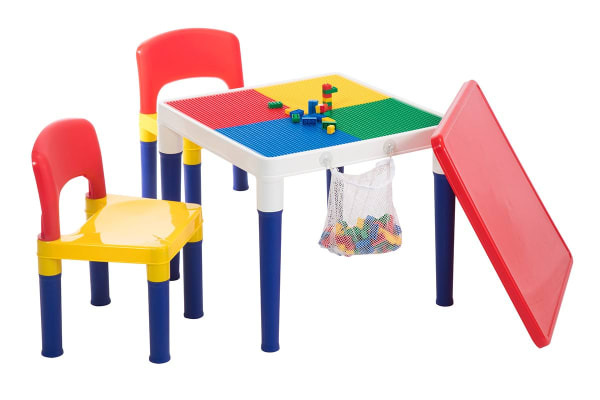 The Lenoxx 2-in-1 Building Block Activity Play Table & Chairs set comes packaged with two chairs and a table with cover, which can convert from a normal play table to a building blocks table base. Your child will enjoy the 100 included building blocks to help get started on their intricate block-construction. This table is compatible with LEGO building blocks, so the architectural possibilities are endless. When it’s time to pack up, the table cover secures onto the table top and the building blocks fit into a mesh storage bag.